We love how makeup can enhance how you look and smooth and soften signs of aging and imperfections. Thankfully, there's makeup out there that can actually help you achieve younger-looking skin, too! When it comes to anti-aging foundations, the formula and the finish are the two most important things to keep in mind. The ingredient list of an anti-aging foundation should include plenty of antioxidants as well as a mix of other skin-beneficial ingredients such as ceramides. The performance of even a great foundation can be enhanced with a beautifully formulated primer. Look for one with a satiny texture that makes it easier to apply makeup and extends its wear time. You also want to keep an eye out for ingredients that make skin look and feel its best. 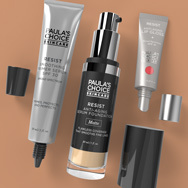 Paula’s Choice Skincare RESIST Smoothing Primer Serum SPF 30 has a blend of antioxidant-rich ingredients along with multiple soothing ingredients, making it an excellent choice for all skin types. It also helps limit pro-aging sun damage with broad-spectrum SPF 30 protection. Read more about what makes a powerhouse anti-aging primer here. When it comes to searching for anti-aging makeup, don’t forget your lips! Taking care of your lips is often an afterthought, but the vulnerable skin of your lips needs exactly what the rest of your face does, including sun protection. The best anti-aging lip products not only fill in fine lines on the lips to create a smoother appearance, but also help reduce the risk of sun damage, for younger-looking lips over time. Paula’s Choice Skincare RESIST Anti-Aging Lip Gloss 40 does all of that, and contains emollients, antioxidants, and the anti-aging ingredient adenosine. Even better, it’s not sticky or greasy, and works either on its own or over your favorite lip color. Before shopping, know this: Many brands, in all price ranges, have developed makeup that includes the antioxidants, skin-replenishing ingredients, and skin-restoring ingredients that skin needs to look and act younger. When it comes to anti-aging makeup, the most important factors are the ingredient list and how the product is packaged—not the brand name or the claims. Look for fragrance-free makeup that's formulated with a cocktail of beneficial ingredients, such as niacinamide and vitamin C. These delicate ingredients need air-tight and opaque packaging to remain effective. Avoid anti-aging makeup that comes in a jar or a compact because any anti-aging ingredients included in the product will begin to degrade on exposure to air and light, from the first time the container is opened. Now that you know what to search for, you’re ready to find makeup that will do much more than just temporarily enhance your looks—it’ll provide long-term benefits as well.